Lest you think, like one of Edie’s friends after walking in and admiring our Christmas tree, that our holiday flair is limited to just a big old tree in one corner of our tiny living room, I thought I’d share some of our other holiday decor while I join in the fun of Jen’s Holiday Tour. It takes me days to get everything out and in place. There are some decorations that go in the same place year after year. 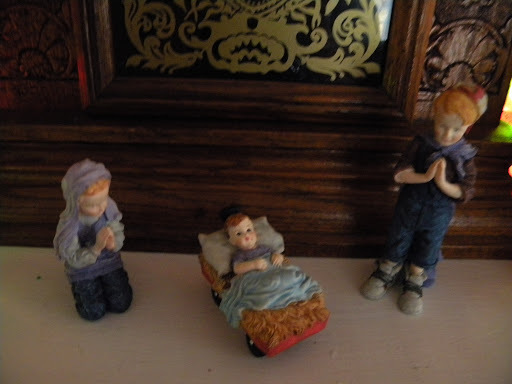 Then there are ones that get moved around if they get displayed at all, prompting the youngest family member to say, “Oh, I didn’t know we had this”. We have an entire section of the attic dedicated to holiday decor,a shelf in the linen closet exclusively for Christmas linens, whose viewing is all dependent on how much I want to clean and make merry each year. I have it in my thick skull that Santa only comes to clean houses and any space that gets rearranged for festive attire must be clean first. As someone who’s not known for her housekeeping skills, it can take me some time to get all the decorations out and displayed. I start slowly, with two special decorations. 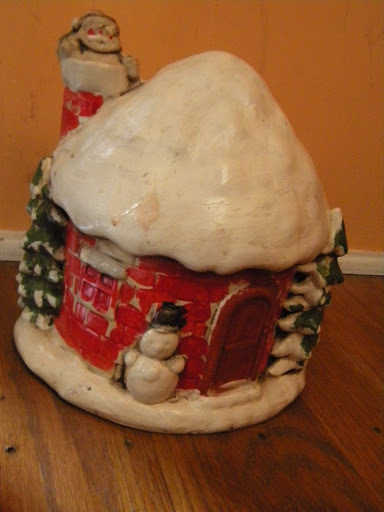 The first one is my Santa house. It sits in the corner, at the foot of the stairs. It was my first successful foray into holiday decoration making. 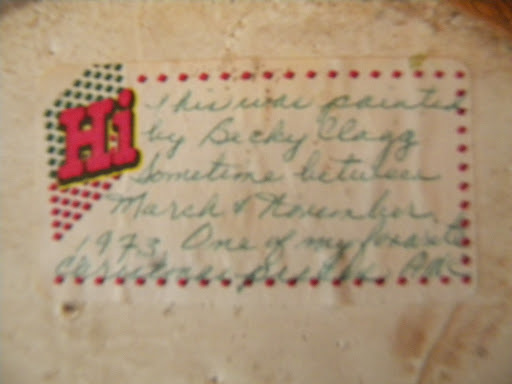 According to the sticker on the bottom, hand written by my mother, I painted this all by my big girl self way back in 1973. I love this Santa. 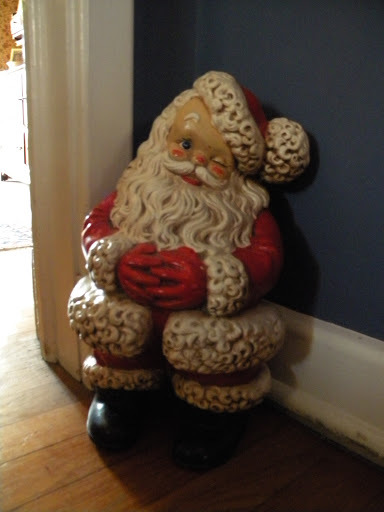 My mother collected Santas over the years and there was a year where this Santa didn’t make it out on display. Horrified at this, I found him in a corner of the basement next to my house and brought them home with me. Those two pieces always said Christmas to me and I am thrilled to watch them become the same for my daughter. Santa lives in a corner in the hallway, situated so that you can see him when you first walk in the door. Actually, you can see him from almost anywhere you stand in my tiny little house, which is good, because he needs to keep an eye on things so he knows who’s naughty or nice, right? When I talk about how my house is small and dark, I’m not kidding. With the days so short this time of year, I look to light up our house anyway I can. 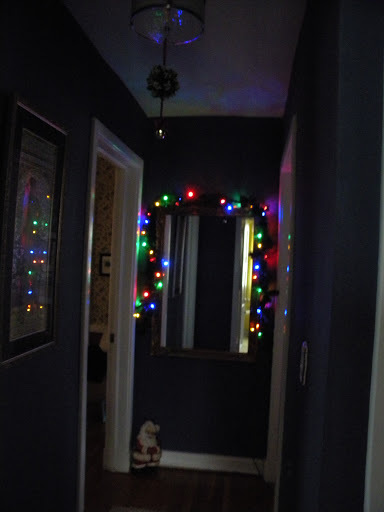 Lights and garland are a theme all over the first floor. Santa sits in a corner, under a mirror that gets a garland and multi-colored lights while mistletoe hangs from a nearby overhead light fixture. Our dining room is a completely internal room – while there is a lovely enclosed porch to the rear of the room, the porch is not weatherized, meaning it’s not a year round room. So the french doors between the spaces are kept mostly closed this time of year. 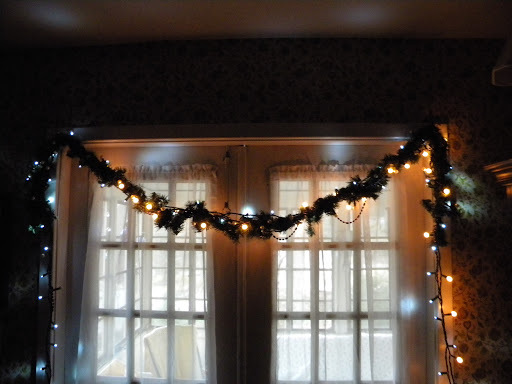 I drape the doors in a garland with a few strands of lights and beads attached to lighten the room up. And if you’re starting to be impressed with the number of handmade items and effort being put into our holiday decor, let me share a secret with you. All the garlands strung around our house are fake. This one in particular, which hangs in the dining room is stored with the lights and beads already wrapped around it. 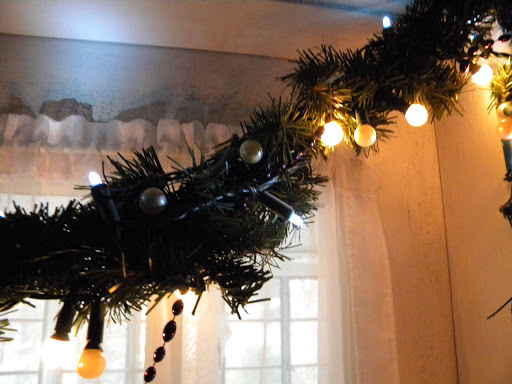 As you can see, one of the light strands has quite a number of bulbs burnt out. I thought that since they were ‘pearls’, it would just look like beads, so instead of taking them down, I just added more. I am that lazy. It may definitely be time to rework that garland though. There appear to be more burnt out lights than working ones and they no longer have that beaded look if you look closely at them. Christmas throws up all over my living room. 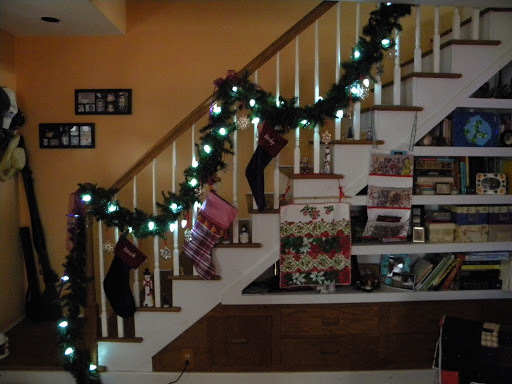 Garland, lights, my sterling snowflakes, stockings, advent calendar, card holder and little holiday tchotchkes we’ve acquired over the years get piled on top of each other on the stair wall. 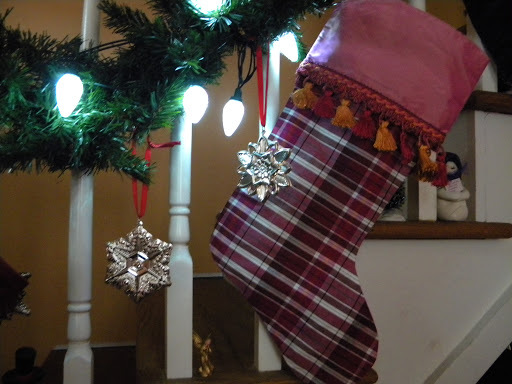 Pat & I have monongramed purple and red velvet stockings from Pottery Barn that we got before Edie came along. I couldn’t find one similar for her, so I made her one instead. The body is a silk plaid, in shades of red and purple, with pink & orange running through it. When I made that for her, her very first Christmas, I had no clue orange was to become one of her favorite colors. The stairs are also a great place to showcase the sterling silver snowflake ornaments Pat’s mother has given me for Christmas every year since we got engaged. 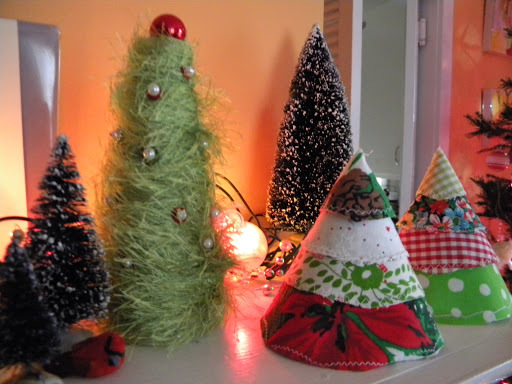 Tucked in on the edges of the stairs are various little holiday figures and some of my bottle brush trees. Every square inch is festive I tell you. The mantel gets a full overhaul. Gone are the clutter of pictures and other things that collect all year long. When Pat’s grandmother broke up housekeeping last fall, he inherited her mantel clock, which had belonged to her grandmother. I didn’t want to move it, so I just decorated around it this year. 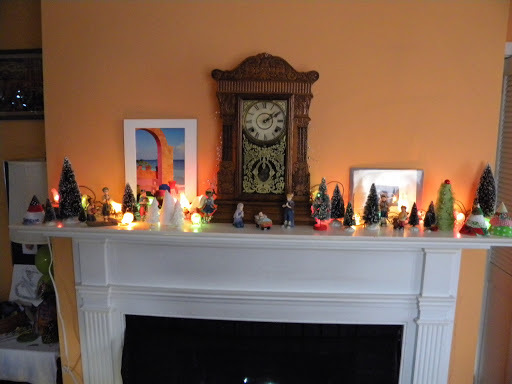 The mantel gets covered in a beaded wire garland, vintage Christmas lights that came out of my Granny’s basement (apparently unused), various trees and a Nativity set that looks like the kids from The Best Christmas Pageant Ever. 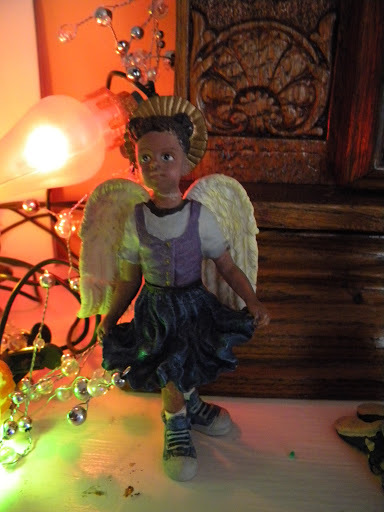 The Angel wears purple high tops. The infant is in a little red wagon. If you’ve never read The Best Christmas Pageant ever, I highly recommend it. It’s a children’s book about a family of troubled kids that go to church because they heard there were free snacks. (There is also a movie version, starring Loretta Swit & a young Fairuza Balk.) They take over the annual Christmas pageant, with some funny and moving results. 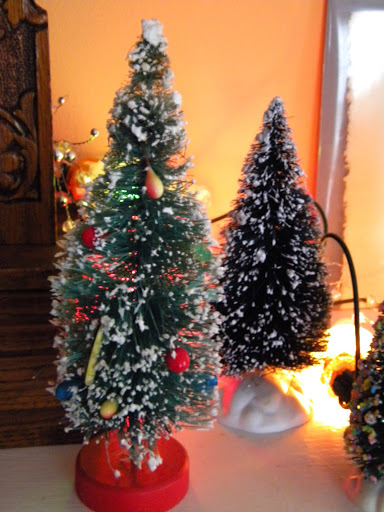 Also on the mantel are a variety of trees I’ve either made or collected over the years. I have a thing for bottle brush trees. Including this vintage bottle brush tree I found at a yard sale and passed up, only to have Edie go back and get it to give to me. 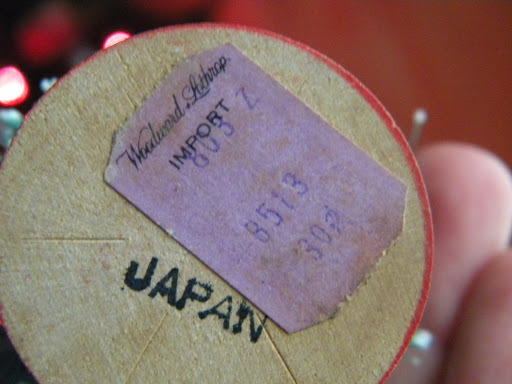 You see, it had the original price tag on the bottom, from Woody’s, for 30 cents. No way was I paying $1 for that. I really am that cheap. Thank goodness my daughter’s not. 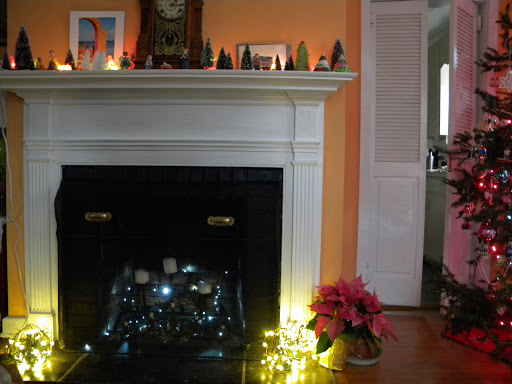 The fireplace and hearth stay the same as they do the rest of the year, although a peace lily plant gets replaced by a poinsettia. It is a working fireplace, but for a list of reasons we don’t use it. Instead, it has numerous candles and Christmas lights that create ambiance. Flanking the fireplace are two wire chicken shaped baskets for egg collecting filled with yet more lights. You can get a sense from that shot exactly how small our living room is. It measures exactly 8 1/2 feet from the edge of the hearth to the front wall and it’s 11 feet wide. Not very big at all. The fireplace is not the only spot we have Christmas lights year round. I threw this strand up over the kitchen sink this time last year and they stayed – as they make a great over the kitchen sink light. And festive too. I did tuck this baby away for a few months though. 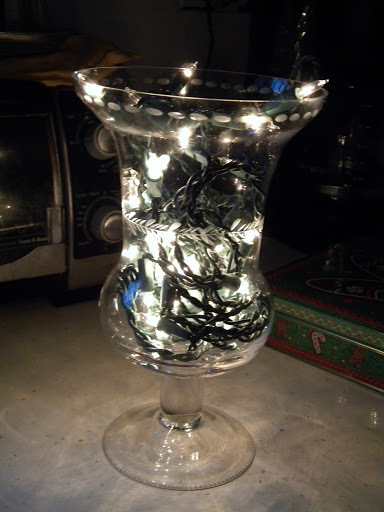 A strand of lights in an old glass vase. It makes a wonderful kitchen counter lamp in these cold, dark months. Never underestimate the brilliance of a single strand of lights. How to decorate a Charlie Brown Tree. Like yours, Christmas “throws up” all over this house. Our rooms aren't large either, but we have quite a few of them. We're always thinking about taking down this or that wall, to make the house look more contemporary, but we only talk. I love the look of your place! Looks like a wonderful family lives there! Merry Christmas! I think it's lovely! Also, I live in fear that an unclean house will result in Santa skipping over me. It's completely unfounded but it doesn't mean I still dont, every. single. year., demand I sweep/dust/shine before my wife puts each decoration down. but, since just this morning I saw a box in a corner that has been there since sometime LAST year, I don't think I have much room for any more demands. I admit I haven't gone all out for several years…it's simply been the tree and stockings. 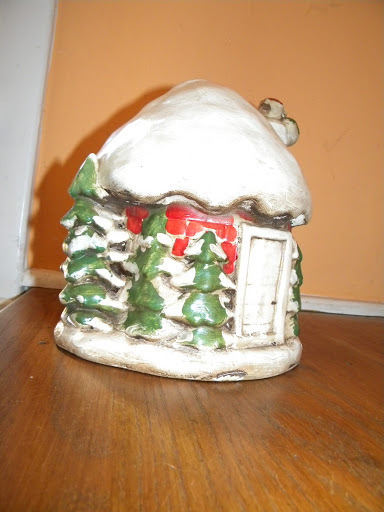 I have tucked away on of those ceramic trees with lights my mother gave me thirty years ago. She had a friend make one for each of us six kids, and I think I'm the only one who still has it…I really should pull it out. My kids always loved rearranging the lights on it…now, I'm starting to get all sentimental! that must have been a trend years ago–to paint those ceramics. Your house has such character, so many little details to appreciate! I bet you have a blast decorating, it shows.